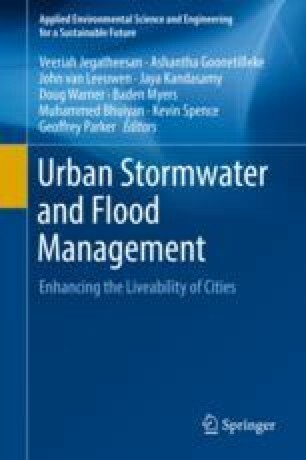 This chapter overviews floodplain and stormwater management from two separate jurisdictions that have different climate, geography and history though having a governance, heritage and culture that is similar. There appears to be an underlying challenge for urban flood and stormwater management to transform stormwater from a hazard to a resource and to control and absorb the effects of flooding through sophisticated, adaptable urban design, smart environmental monitoring infrastructure, land use planning, evacuation management and planning and early warning systems and educated, informed communities. The common obstacle, seen in this review of evidence from the UK and Australia, despite significantly differing environmental, historical and governance contexts, is the distributed nature of the problem and its possible solutions. Water suffers from a version of the ‘tragedy of the commons’ in which its position as a common good – or indeed, a common hazard – makes individual stakeholders reluctant or unable to participate in effective action to manage the whole system. However, the growing number of catchment partnerships and community-led flood management initiatives bring public and private stakeholders together with the water management problems they face and encourage them to take common ownership.